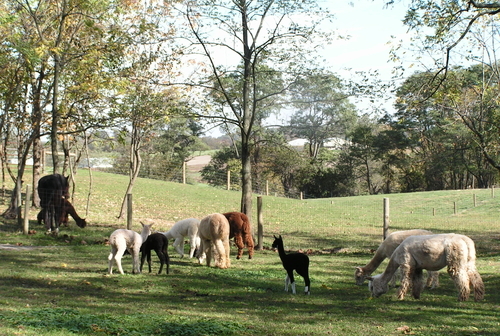 Golden Age Alpacas is a farm located in Mount Joy, Pennsylvania owned by Pam and William Potts. Golden Age Alpacas agist our animals at Cloverleaf Alpacas (our daughters farm). WELCOME to Cloverleaf Alpacas!! We are located in Lancaster County, right in the heart of Central Pennsylvania. Our alpacas can be seen in our pastures amidst the soft rolling farmlands. 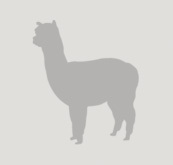 Our goals at Cloverleaf Alpacas are simple. We strive to improve our herd each year through careful selection of foundation breeding stock and the herdsires we use. We are also committed to our clients and their journey in the alpaca industry. We remember what the leap into alpacas felt like, and the importance of those first contacts. Most of all, we breed alpacas for the lifestyle they foster, the dynamic industry, and most importantly the friends we've met along the way. 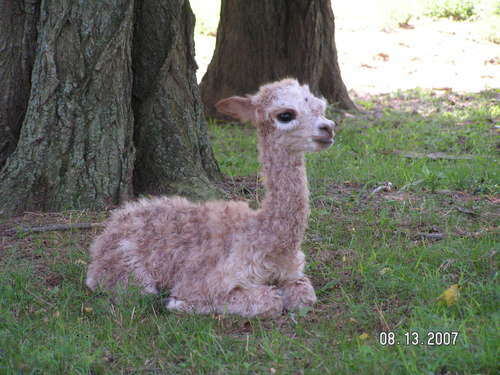 Whether you are new to the beauty and wonder of alpacas or looking to add ribbon winning breeding stock to your existing herd, Cloverleaf Alpacas has something for you. Our hard work and much labored choices have paid off in the show ring. Golden Age Alpacas is located amid the rolling hills of Lancaster County, Pennsylvania. We share pasture space with Cloverleaf Alpacas, 1650 Cloverleaf Road, Mount Joy, PA 17552 and work very closely with them in our endeavor to promote the alpaca business. We are a retired couple enjoying the hands on experience of raising and breeding alpaca. Golden Age Alpacas is striving for excellence in our breeding program; reaching for improved off-spring in each generation by breeding our carefully chosen foundation stock to the best matched sires for quality fiber and conformation. 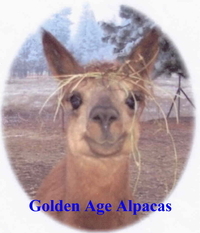 At Golden Age Alpacas, we diligently work with each visitor and client to make their experience enjoyable; guiding them in making the best choices for their goals, whether for a start up herd, for breeding, for fiber or for building on their existing herd. We are also working with those who want a couple of pet Alpacas to grace their pastures. This assistance continues after the sale to make the start-up process go smoothly. We love questions and helping people learn about these wonderful animals and their care. Visitors are always welcome by appointment! 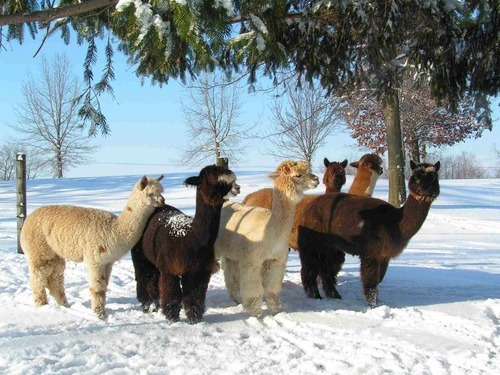 We not only sell Alpacas; both breeding males and females and fleece quality males, but also are very interested in promoting their fabulous fiber and the quality products that are made from it. We have a retail store, Alpaca and Beyond, on the farm carrying both the raw fiber and the clothing products that are classically designed to last for generations. 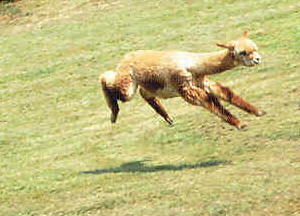 Alpaca fiber is a relatively rare fiber recognized by the Incan royalty for their royal garments. If you are interested in learning to spin or already an experienced spinner, we have quality fleeces in colors ranging from true black through brown, fawn and white. We also offer handspun yarn and handmade items from this wonderfully warm and light weight fiber. You are always welcome to come in and browse! Pam has been a judge for spin-off competitions for 3 years and enjoys working with and seeing the fleeces that are entered. Spin-off competition can be a real tool in evaluating your herd and also your feeding set-ups and grazing areas. Improvement in these areas can make a big difference in selling raw fleeces and the rovings and yarns that you get back from a mill for sale. July 2006 we attended a seminar on what judges are looking for when judging fleece at shows. This seminar gave us a real understanding of what characteristics to look for when purchasing alpacas and when choosing a herdsire in the breeding program. We got hands on practice skirting the fleece and judging it ourselves. We at, Golden Age Alpacas and Cloverleaf Alpacas believe in educating ourselves so we are up to date on issues in the this vigorous alpaca business.